The thing is, she’s only 28 but she writes a bunch of songs that are 70 years old. You listen to her album of mostly originals, “Way Down Low” and say, ‘Oh, that’s a lovely song–must be Cole Porter.’ Or ‘Wow, that’s a real country classic; now, who did that in the original?’ Till you look at the liner notes and see that she wrote them both. She’s so young and so just getting started that she funded her second album via Kickstarter, a very cool platform for raising money from people just like you and me for worthy projects. It’s a very appealing concept, well worth taking a look at it, folks. 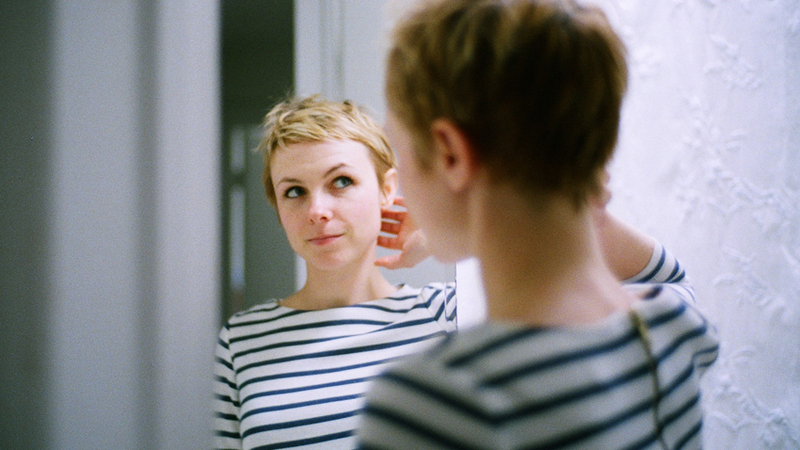 And while we’re on the subject, let’s all remember that young artists like Kat Edmonson are struggling to make a living, and we should all happily pay money to buy their CDs and thereby encourage them to keep creating for our listening edification. Meanwhile, back at the music–such music for a young ‘un! Her covers are original, her originals draw impressively from fine traditions, and despite her slight, breathy, Gretchen Parlato-styled vocals, the treatments are honest and engaging, and the bare-bones arrangements just perfect, one after the next. Her first album, “Take to the Sky” (2009) has way too many nags that have seen better days (‘Summertime’, ‘Angel Eyes’, ‘Night and Day’, ‘Charade’, ‘Just One of Those Things’). But she also dresses ‘Just Like Heaven’ (The Cure) and ‘Lovefool’ (The Cardigans) in the same fabric. No mean feat, but maybe not the battle she should be fighting, methinks. Then she does give the brilliant ‘Spring Can Really Hang You Up the Most’ an a cappella treatment, for which alone she deserves a bouquet of fresh daisies. This li’l young lady also displays some heavyweight savvy. Do you remember The Chiffons? A pretty tame black chick group from the early ‘60s? Their main clame to faim is that George Harrison was found culpable of unintentionally plagiarizing their song ‘He’s So Fine’ (“Doo-wang Doo-wang”) for his ‘My Sweet Lord’. Remember their other big hit, the Goffin-King ‘One Fine Day’ (“Shooby-dooby dooby-doo-wop-wop)? Listen to what Kat does to it. Oh, my. Then listen again. And again. John famously said that Elvis died in the army. He should know. He contracted a fatal disease on the roof of Apple Records and passed shortly afterwards in the board room dissolving The Beatles, a couple of 1970 Plastic Ono cuts notwithstanding. For the life of me, I’ll never understand why the radio plays ‘Woman’ on the anniversary of his physical death rather than ‘Norwegian Wood’. I’ve never bought a record of his after ‘Instant Karma’. For me, his solo career was a long string of embarrassing self-parodies. This would include, of course, the original ‘Starting Over’, a drossy pop throwaway which just makes me cringe and long for the good old days from ‘Not a Second Time’ to ‘Dear Prudence’. But then this impudent little Austinian Kat Edmonson comes along and shows me what I might have been missing in her glowing, loving, truthful rendition of the song. Or maybe it’s a recreation, I don’t know. But it sure is fine. And all that’s just a warm-up for her second album, “Way Down Low”. The album opens with ‘Lucky’, a breezy, xylophone-adorned ditty qua chanson with a cheery, Central Park video to illustrate it. ‘I Don’t Know’ is a mega-obscurity by the “Latin Funk” group Malo, a forgettable group from a best-forgotten sub-genre. It was headed by Carlos Santana’s little brother Jorge. Musically, you might call Malo the not-too-bright younger sibling of Santana. And if it’s not enough that Malo was insignificant, they were prolific while being so. They made four albums within just over a year. ‘I Don’t Know’ is from the third of them, “Evolution” (1973). It was written by guitarist Clarence “Sonny” Henry, who wrote the hit “Evil Ways” for Carlos and his buddies. The original is best forgotten. The two reworkings deserve many listenings, a task I’ve been dutifully and gladly performing. What does Ms Edmonson do with this chunk of coal in the original rough? She puts it on her CD of originals twice—the second track (as a muscular, straightforward acoustic rocker) and the closer of the CD, ‘I Don’t Know (Reprise)’. They both have videos portraying two disparate facets of her persona, the former Kat qua manic, the second at a pace akin to a fluish nonagenarian tortoise, a veritable advertisement for suicide. I believe there are two kinds of people in the world—those who get “Pet Sounds” and (the poorer ones,) those who don’t. It’s Brian Wilson’s magnum opus, one of the masterpieces of our times. It has an overwhelming amount going for it–melodies, counter-melodies, arrangement, orchestration, a genius sound palette. What Kat has done for us is to take one of the many brilliant pieces from the album and strip away the orchestration, leaving us with a piano trio treatment of ‘I Guess I Just Wasn’t Made for These Times’ as a song, with all its melodic beauty and lyric charm front and center. It takes a lot of courage to jettison the sonic wealth Brian invested in the song. But each element is so fine that it’s a real gift to be able to focus on ‘I Guess’ as a song. Thanks, Kat. 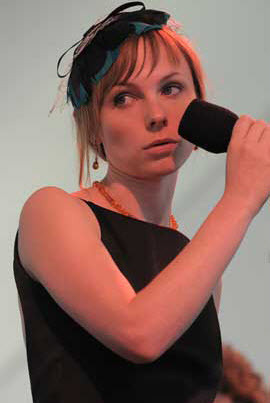 The album has several more songs from the early 1950s that Kat Edmonson wrote and performed in the 2010s: ‘This Was the One’, ‘I’m Not in Love’, ‘Nobody Knows’, as well as a country-swing duet with Lyle Lovett and a cover of The Ink Spots’ ‘Whispering Grass’. Kat, I wish you lots of commercial success to fuel the monster talent residing in that deceptively modest container. Can’t wait for your next album. I couldn’t resist one little kiss. But now the bacchic thrill is gone. No, champagne does it every time. When bubbles get a hold of me. I got no hope, I’m such a dope. In wine historiography, you’ll find me under ‘fancy-free’. When champagne does it every time. She sounds like a cross between Carol Channing and Ertha Kitt (right time period too). I like it. She is very similar in style and tone to Stacey Kent, which is no bad thing really. Stacey sticks to standards but this girl is an original. Did I miss who the backing group is? I know Stacey Kent pretty well. I find her pleasant, but not overwhelming. I like Holly Cole better. But, yeah, this one’s an original. I don’t know any of the backers. The producer is a famous guy whom I don’t know. @Mike–check out Blossom Dearie (real name). She’s a trip.